I am the proud owner of a Valubuild SIP home. I believe I have the best home money can buy, but I must emphasize that the Valubuild SIP home, or any SIP home for that matter is not a "Do it Yourself" project. First, the day your SIP panels arrive you realize that you have taken on a very huge project. Expect a half a day to unload the panels and be sure to get a very big forklift with boom that will extend a good distance. Good luck to you going over the inventory list so that you can sign off to the delivery driver. It took a lot of time just getting the SIPs off of the truck and finding a place to put the SIPs. Don't forget about the next truck arriving that will have your lumber package. We were lucky in that the driver with the lumber package stayed overnight on a Sunday so we received the lumber early on Monday morning with time to spare. Valubuild uses a very good company in Idaho for their lumber package. I was very impressed with the quality of the lumber and the customer service of their lumber supplier is first rate and even helped us with engineering loads. You must understand that the SIPs cannot be loaded in order at the factory so you will need to spend another day arranging the SIPs panels in the locations and order of installation. By this time you will realize that the SIP home does not go up in 3 - 4 days as quoted by many SIP companies. Now, if you have your foundation poured and it was poured perfect, then you will now set up your sill plates to be close to perfect as possible to accommodate easier construction of the SIPs. By this time we realized the importance of having a very good carpenter on board with us to ensure the critical first step be done correctly. We lost our first carpenter as he was not familiar with SIPs and did not want to get involved. We found him at a friend's construction site and found that he was quite quick and very good quality. He was a bit demoralized when he saw the scope of the project and quite frankly had worked with traditional framing his entire career and felt out of place with SIP construction. He visited our site for a couple of weeks during actual SIP construction and joked with our current carpenter on how long the project was taking and that if we had used traditional framing the project would be done by now. Of course I'm saving time on not having to insulate the building, but not a big deal as we have insulation companies here that are in and out in a day and charge about what the insulation costs if you were to buy it at Home Depot. Again, I am fond of the higher R Values of SIPs and again am very happy with my solid, well build Valubuild home. Our current carpenter is well accomplished and a very nose to the grindstone kind of guy who makes no excuses. I find that we are very lucky to have him as the other carpenters in the area who frequent our SIP project just scratch their heads on what we are doing. It's ironic that I chose a SIP home to try to eliminate expensive carpenter labor and do it myself with a few friends like all the SIP videos and books show. After the first day on the job with friends, you quickly realize that this is going to be a very long job and that you are not going to do it correctly. Unfortunately, you only realize all the mistakes you would have made when your carpenter goes to work. They do this every day and know all the tricks of the trade. You also learn that they are unable to use many of their tricks on the fabricated SIPs panels. By the way, we had our panels cut at the factory to save time in the field, which it did, but left us with fewer options in the field to make modifications that will always be a part of your project. After a few days of building, and depending on the weather and season, you realize that this is going to be a long project and that you now must prepare your SIPs to be protected for the long haul. I went out and bought about $200 in tarps and other hardware to keep my SIP investment dry and off of the ground. I got my first full night of sleep that night at least knowing that my SIPs would be protected. I am lucky to be building in a very small community that is pretty safe from theft. My biggest worry was someone stealing one of the SIP panels. Several people talked about how fun they would be to take out into the lake for a boat or pier platform. Horrible thought when you think about the cost of an 8' x 10' SIP-about $150. each and having to order, and wait for delivery could really slow down your project. We live near the SIP factory so we are able to go down there and pick one up. Along those lines, if you cut your own SIPs, don't mess up beyond the two extra panels they give you for mistakes. Of course you can always work in some traditional framing, like we did so that the project can keep moving along! It is a bit sad to do this and defeat the air tight SIP and high insulation value, but it cost a lot more to have men on site sitting around. I must emphasize that you really don't see that many SIPs home if any. I have only seen them in books, or on the Internet. WHY? Why don't SIPs take over the building industry? All I can say is that it takes your carpenter about a week to figure them out and by that time they realize that this is not an efficient system by any means and all that they have learned is useless going forward. Again, I bought a SIPs home to eliminate expensive professional help and find the ultimate system for the do it yourself builder. Straw bale, log home, timberframe, etc. etc did not seem to fit the bill, but the SIP home seemed to finally be the ultimate do it yourself system. I now see that I was very wrong in this thought. 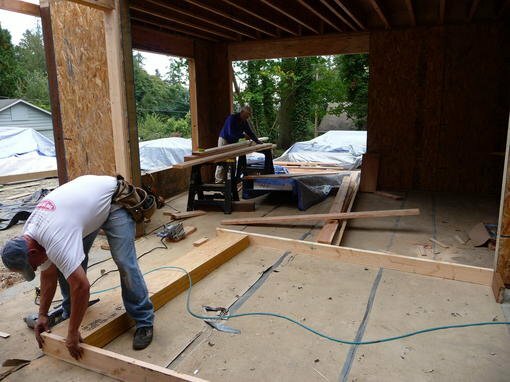 Along the lines of SIPs bucking the traditional system of a stickbuilt house, you must realize that your local building authorities are not used to these systems and you will have to jump through many additional hoops to get your SIP home approved. First, if our home was a stick built home then we would have received our permit right away. However, our county in Washington State required that all SIPs homes get the stamp of a structural engineer. The month that it took to get this stamp delayed our project by one year as we missed our building season out of the rain. It also cost us another $1,500 for the stamp. Now, you must realize that the engineer is responsible for your SIP home from not collapsing on you so I believe he or she is going to over-engineer your design to handle the loads. For example, I have never seen a 6" x 6" column used in the construction of SIPs homes. Well, our small 1,200 sq. ft. home uses a total of 16 of them and a few are over 20' in height. 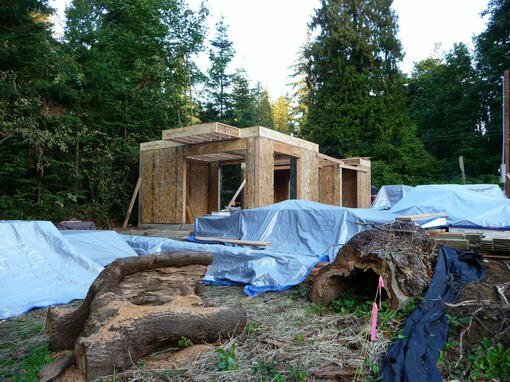 I must emphasize that our home is custom and such columns are needed, but still this is something I did not anticipate with SIPs construction and it has slowed down our project quite a bit. Again, I am very happy with my Valubuild SIP home and know for a fact that it is the strongest, quietest, and best build home in the area. I just want to emphasize that this is not a do it yourself project and that you will have a hard time finding a carpenter to help with the project. I have also found that this construction is the one of the most expensive type of systems out there and is difficult to modify in the field. I know that there are many builders out there that build exclusively in SIPs and these are the people you should talk with first before you purchase a SIP kit. Get a quote from them in writing on what the cost will be to build your SIP kit and see how much you will save. Perhaps you will find as I did that you will spend more on this type of construction, but in the end will receive a better build home. As we complete the first floor of our home I am feeling less overwhelmed thanks to our rock solid carpenter who took on the SIP project and now I am on to thinking about eliminating the off gassing of all of the chipboard OSB plywood that lines the interior of a SIP home. This will be an additional cost, but in the tradition of a SIP home I should enjoy a higher level of air quality once I install a proper heating system that allows air exchanges within the building envelope. I am also realizing that I now own the building of the future that is quite green and will save a lot of money in heating and cooling bills. I will never forget, however that in no way is a SIP home a do it yourself system that goes up in few days with a few unskilled friends. I have three remodeled homes under my belt and am quite skilled, but found myself overwhelmed from the moment the SIPs arrived. I will continue to elaborate daily on my experience building with SIPs. Again, I must emphasize that SIPs are a very strong and valuable building system, but you don't save any money on construction and very important is the fact that this type of construction is not a "Do it yourself" system. We had 3 men on the SIPs job today, the minimum number of people required for SIPs 8' or larger. One of men came down with the flu this morning and could not follow me out to the building site, however I met up with my carpenter who is quite strong and thought the two of us might be able to hang some panels. The two of us had a very hard time getting the panels up to the second floor and decided it not smart to continue. Wasted half of the day as we had to leave at 1pm. Here again you see the costs that are added with SIP construction. My carpenter told me that he could have continued a stick frame constructed home by himself today and that 2 or 3 of us could have lifted the entire wall the next day off of the floor and into place. With our 3rd man gone all construction halted today because of the SIPs system. Some other thoughts. I choose the SIPs system as the house should have gone up in 3 - 4 days--all panes were pre cut at the factory and the structure is small, 1,200 sq. ft. The week or so that I would have saved was to be used to wire the completed shell. The home is taking longer than conventional framing and now the SIPs have become a liability as far as wiring the place is concerned. I must now fish my electrical wires through the styrofoam chases and this will be very difficult. Again you see the costs going up daily with SIP construction. I built a 3000 square foot house in 2001. I bought the kit off the internet. I had no building experience at all. I hired a contractor for 8 weeks to help me dry in the house. When he left the house was dried in and I then hired other people to help me finish the project. It ended up taking me over 1 year to finish the house. I learned that I could have saved money by buying my rafters and trusses locally and just ordering the Sips from a manufacturer. I could have saved about 10 to 12 thousand dollars. 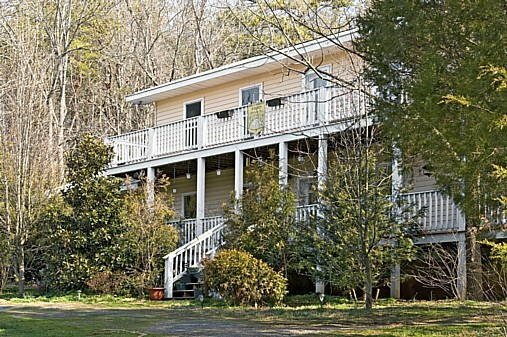 As it was, I only paid $36,000 for the kit and completed the house with a Galvanized steel roof, wraparound 2 story deck and wood floors for $30 per square foot. Love my energy savings as my only bill is from the electric company and averages $130 per month. I air dry my clothes and use propane for heat. There is a God afterall! Valubuild is out of business! This company made you think that anyone could build a SIP house in a matter of days! SIPS are very, very difficult to lift, cut, place, etc. Putting together a series of 2" x 6" is much easier and every carpenter knows how to build with with standard system. Show your carpenter a I SIP house and you will demoralize him! Yes, SIPs are the ultimate house to live in, but don't think you can put one of these together yourself! If you do decide to go forward, be sure to hire a contractor that specializes in SIP construction. If you go to Valubuild.com, you will find yet another SIP company using the old Valubuild videos and literature that shows how easy anyone can build a SIP home. I feel for those who continue to get duped into thinking they can just "snap" together one of these homes. If you do decide to go against common logic and build one of these yourself, do yourself a favor and contact "Premiere Panel" in Fife (Tacoma) Washington. This is the company that Valubuild uses to furnish panels. If you go direct to Premier Panel, they will tell you the truth on building with SIPS. Yes, a great system, but not for the do it your selfer. They will also steer you to a SIP builder as the common carpenter knows nothing of this system and once they do give it a go will never get involved in such a project again due to the heavy lifting, miscut $180. SIP panels, and all the gluing and foaming needed as you install splines inbetween panels. Also, good luck with you local building department in getting one of these improved. They will want to cover their own hide and overdesign it to guess what will pass code. Your electrician and plumber will also have a great time and charge you tons of money to wire and plumb the place as they will have to fish wires and pipes through the blind channels. Why has 2x4 and 2x6 construction been around for over a 100 years? Is this not the SIP's brightest days? Why isn't everyone in the world building with SIPs? Have you ever seen a SIP house in the flesh? Go ahead and be a pioneer like I was, and like pioneers you will have earned your wounds! Good luck to you my friend in SIPs! If you were the carpenter you hired, would you have been happier with the result. I have been in the construction business 35 years, Much of my youth as a finish Carpenter. do you think it would have worked out financially if you had been more experienced?